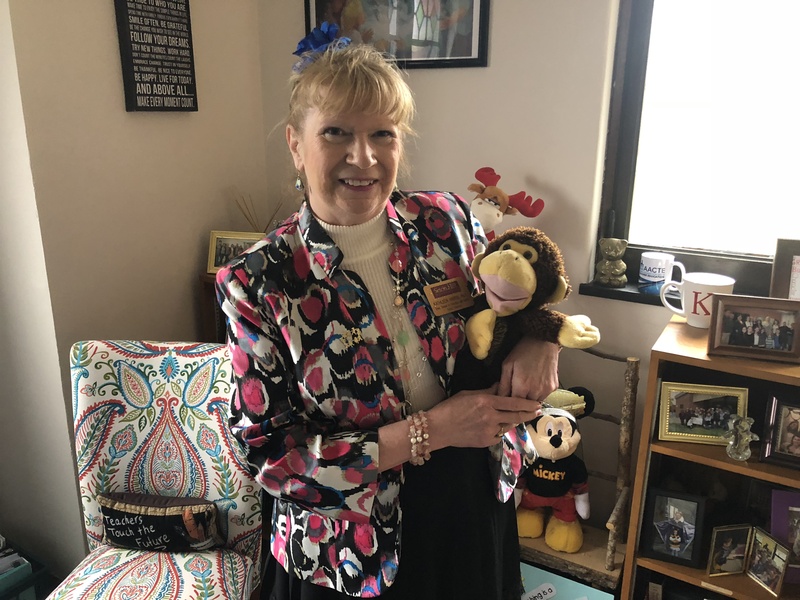 Kathleen Harris, SHU’s new dean of education and applied social sciences, holds Zippy, a puppet she has used since she began teaching. Photo by C.Srager/Setonian. This childhood passion drove Harris to teach religion through CCD while she worked as a secretary during the day. “On the weekends and a couple weekdays, I would be at different parishes teaching children, and I knew that I wanted to inspire and be there with them in the moment teaching them new discoveries and knowledge,” Harris said. One day while teaching at a parish, a couple sisters approached Harris after observing her and told her she would make a fabulous teacher. Harris said she felt a tugging at her heart and that she knew that she had found her vocation. Harris used the money she saved working as a secretary to go to college. After receiving her degree, Harris taught young children for 25 years and helped open two preschools for two different Catholic elementary schools. Harris knew that she wanted to teach at a Catholic liberal arts university similar to Notre Dame College of Ohio, where she attended as an undergraduate. Harris said she was also drawn to SHU because the courses embraced her passions of early childhood and special education and the Child Development Center. “[Seton Hill] having the CDC was a big plus because I wanted to be in an environment where I could inspire teachers, but I could also give teachers opportunities to do research, observe, play and teach with children,” Harris said. After teaching for 10 years at SHU, Harris was asked by Provost Sister Susan Yochum to become the new dean of education and applied social sciences. Although Harris is looking forward to learning more about the fields of her colleagues, Harris said with her new position that she wants to ensure the school of education and applied social sciences continues to focus on the students. “I am excited for collaborating more together, finding ways that we can work with other schools, embracing new challenges that come with my position and with the school and making sure that we are working to our fullest potential to serve our students because that’s the most important thing: serving our students,” Harris said. Harris said she wishes when students leave SHU that they are going hazard yet forward while being the very best in their career field. Harris also said she wants students and professionals pursuing higher education to take leaps of faith.